At a Repair Café, people who know how to fix things help people who have something that is broken (furniture, electrical appliances, electronics, clothes). They work together, sharing knowledge, so that hopefully the owners will feel more comfortable doing their own repairs in future. Lillis decided to probe a little deeper and met with Nisar Ghani, the City’s Sanitation Manager. Nisar had seen a repair café in Toronto and thought it could work in Prince Albert. Habitat for Humanity also stepped on board to provide some equipment and supplies. Most successful repair cafés are located in a municipal facility so the group approached Prince Albert’s Executive Council and City Council to ask for their support for the concept of a repair café and to recommend a site that they could use. At the January 22, 2018, Council meeting, the City agreed to provide free use of space at the Margo Fournier Centre once a month and asked the group to report back on the Repair Café’s progress in about 8 months. Lillis was pleased that the recreational facility was in a central downtown location. Repair Café Prince Albert registered with Repair Café International and received a digital package containing posters, logo, registration and feedback forms, and suggestions on how to get started. 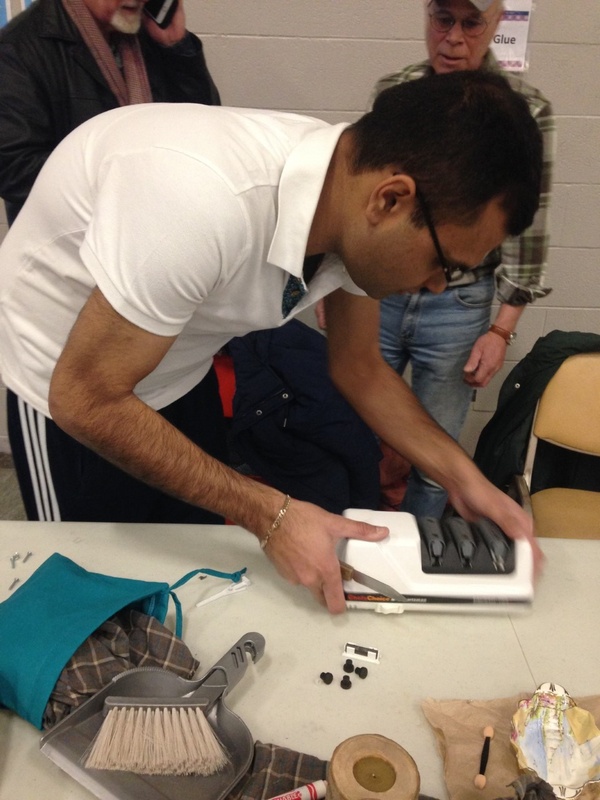 This streamlined the set-up process for their first Repair Café on March 3. Lillis also set about looking for volunteer fixers. She signed up her husband Steve first of all as he is a prime fixer – “It’s something I’ve always done, and over the year[s], I’ve probably saved thousands of dollars just from not replacing stuff,” he says. Steve, who works at Saskatchewan Polytechnic, handed out notices looking for possible fixers and so did Habitat for Humanity. A couple of other people stepped forward thanks to local media coverage. There were four repair tables at the first Repair Café for sewing and mending, furniture repair, electrical, and electronics. As people dropped in, they signed up at reception and were directed to the appropriate table. In the end, the Café handled 24 items although not all of them could be fixed on the spot. Some, such as a turntable, will be coming back in April once the owners have ordered the necessary parts. Most of the fixers provided their own tools, but Habitat for Humanity provided some through their ReStore. Other essential items proved to be extension cords and task lighting. Prince Albert’s next Repair Café is on April 7 and there will be a fixer on hand to help with bicycle repairs, but the real focus on bicycle repairs will be at the May 5 Café when they hope to be able to work outdoors with 4 fixers and a short session on bicycle maintenance. The City is considering donating a few bicycles from the police compound and Lillis has suggested the Repair Café as a possible outing for Big Brothers Big Sisters as well as an opportunity for some of the youth to help repair and then own one of the donated bicycles. If you’re interested in helping out, contact Lillis at repaircafeprincealbert@gmail.com. You can follow Repair Café Prince Albert on Facebook. There will be a Repair Café in Regina from 1-4 pm, May 27, at the Central Adult Library. Saskatoon’s Library of Things held a Mending Meet-Up in February and may sponsor similar future events.